This next couple has been in love for the last 40 years and decided to celebrate their 38th wedding anniversary in style! With unbelievable connections from her international hair modeling career, Edit tapped her friend and fashion designer Makány Márta to make her two dresses that would match her alternative and completely fabulous style for a photo session. What would you do if you could get a designer makeover for your anniversary? Find all of the gorgeous images from Bell Studio here! You know you can't resist! 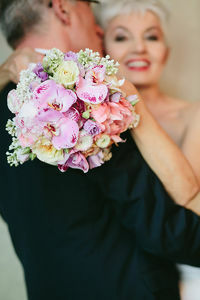 Edit and Lajos feel they are the luckiest people in the world, because after falling in love at first sight almost 40 years ago they still love each other. Edit’s life totally changed when she started her model career a few years ago. She was chosen by a famous Hungarian hairdresser as his model for the Alternative Hair Show London. This is not the end of the story. She was picked out by an English hair artist and was taken to LA to work for him. These new experiences made her become more creative, self-confident and experimental and today they are celebrating their 38th anniversary. One of the couple’s friends owns a vintage style flower showroom and she was willing to provide them the shop for the photo shoot. The main colours of the decoration were ecru and yellow because these are Edit’s favourite. Both of them wanted something modern still traditional. They decided to use some china and silver cutlery inherited from the family. Edit and Lajos decided to celebrate their wedding anniversary in an extraordinary way. They asked Hungarian fashion designer Makány Márta to make a dress that fits Edit’s open-minded personality and makes her look more fabulous than ever. Edit chose a mermaid dress because she had never tried anything like this before. Lajos had a black suit with white shirt for keeping it simple. The second dress was even more extraordinary than the first one, it beautifully fitted Edit’s unique look. The yellow flower bouquet was also made by the flower shop owner, Viola Violetta. No one from the family knew they were having a photo shoot, it was a surprise for them. The only one participating in it was their lovely dog, Vackor, who was taken from a dog shelter years ago. He didn’t really understand what was going on but felt he had an important role.